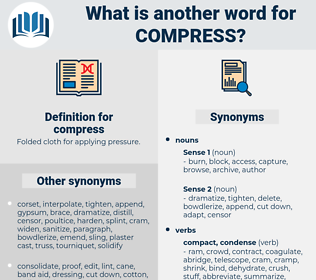 What is another word for compress? Folded cloth for applying pressure. make a long story short. disperse, stretch, increase, add, raise, amplify, strengthen, loose, uncompress, fill, allow, free, open, blow up, lengthen, uncondense, let go, loosen, extend, enlarge, untie, release, grow, Unwrinkle, expand. snowball, swell, scatter, distend, dissipate, puff, accumulate, inflate. I accept this as a very reasonable conclusion, and hold the same rule applies to the sun, and that the sun's " enormous pressure, increasing to its center," would compress its inner portion to the density of a metal; and that the sun could not revolve upon its axis and retain its rigidity as it does unless its inner or central portion was as rigid as steel. 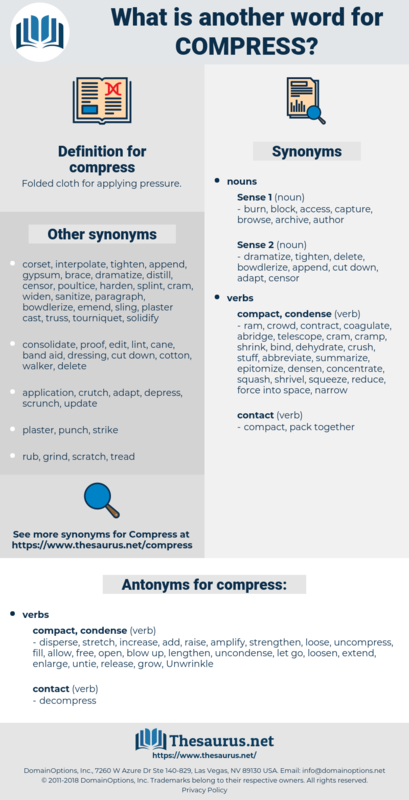 Compress it above the wound.